Everyone loves turkey at the holidays but few seem to make it during the year. This is a real shame because it is a flavorful, healthy meat, and when cooked with sous vide turkey is incredibly tender. 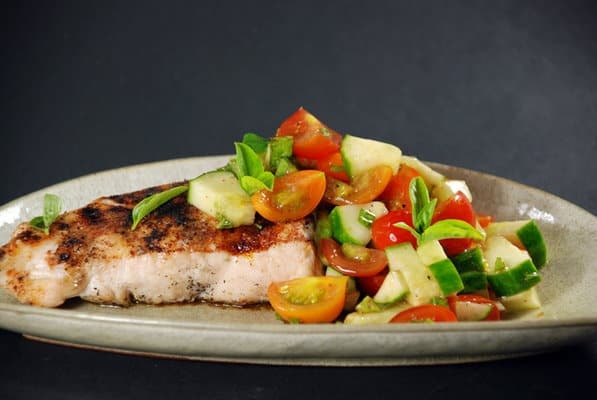 I saw some nice turkey breasts at the store the other day and decided to cook them sous vide, sear them up, and serve them with a cucumber and cherry tomato salad fresh from our garden. While I sous vide turkey breasts in this recipe it would also work great with turkey cutlets, or even chicken breasts. Before sous viding the turkey I seasoned it with a simple BBQ spice rub with coriander, garlic, onion, paprika, and chile powder. You can also use your favorite spice rub that you have on hand. I also set some of the spice rub aside to use after the turkey came out of the sous vide pouches. Then I sous vided the turkey breasts for around 3 hours at 141°F (60.5°C). You can cook them as low as 136°F (57°C) but I feel like they turn out a little too "raw" tasting for me. Some people sous vide turkey breasts at 147°F (63.8°C) but they come out drier than I prefer. Once the sous vide turkey breasts were done cooking I removed them from the pouches and patted them dry. I let them sit out while I made the salad so they would cool off slightly and I could sear them for longer. I then sprinkled the remaining spice rub on them to help form a crust and grilled them over high heat until they developed nice marks. The cucumber and cherry tomato salad is just a simple mixture of fresh produce from our garden. Bell peppers, or even spicy peppers, would be a great addition and I love corn in salads like this. It's just topped with olive oil and some white wine vinegar to add a little richness and brightness to the salad and the sous vide turkey breast. The salad and the sous vide turkey breast come together for a light summer meal that showcases the tender turkey and also the fresh summer vegetables. If you would like more information about the modernist techniques, ingredients, and equipment used in the Sous Vide Turkey Breast with Cucumber Salad you can check out the following. Mix together the spices in a bowl. Salt and pepper the turkey then sprinkle with 3/4 of the spices. Place in the sous vide pouch and seal. Preheat the water bath to 141°F (60.5°C). Place the sous vide pouches in the water bath and cook for 2 to 4 hours. Make the cucumber and cherry tomato salad by combining all of the ingredients in a bowl and mixing well. Take the sous vide turkey breasts out of the pouches and pat dry. Lightly sprinkle the remaining spices on the turkey. Sear it until it begins to brown, about 1 to 2 minutes per side. Remove the sous vide turkey breasts from the heat, top with the salad and serve. 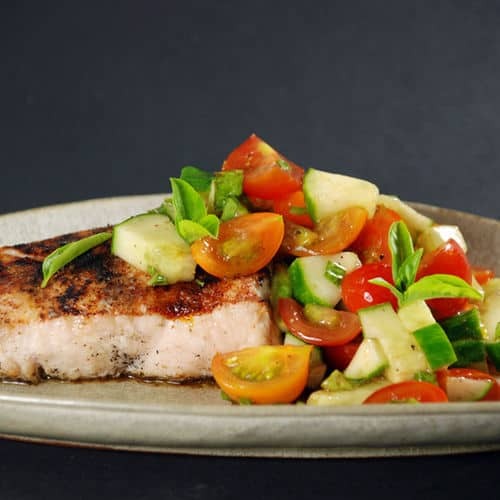 Sous vide turkey breasts are tender and moist and go great with this cucumber and cherry tomato salad.